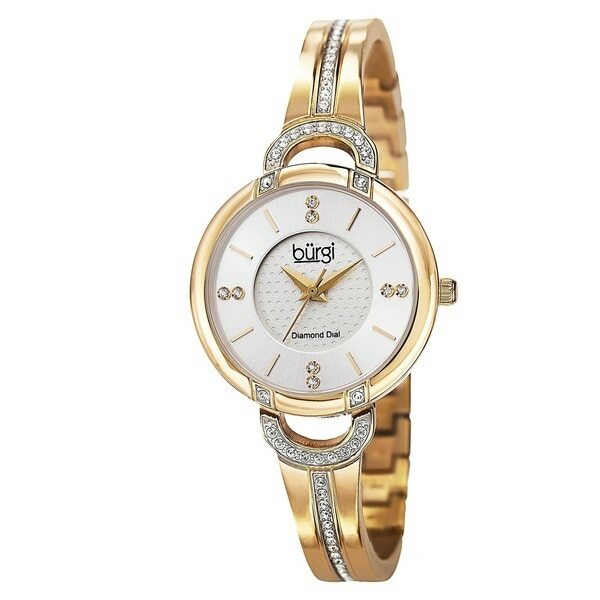 This glistening ladies Burgi watch is sure to impress. The layered textured dial features genuine diamond markers while the bracelet is accented with crystals. With a Swiss movement and a stainless steel built, this watch is sure to deliver. This Burgi women's Swiss quartz watch is an elegant addition to your jewelry collection. This watch gives the appearance of a bangle bracelet that can be worn in a stackable manner. The diamond accents running through the band and in the clock face add just the right amount of sparkle to this goldtone watch. This watch has gotten all sorts of compliments every time I wear it. It is dressy but not so much so that I can't wear it to work. As I love western, in my mind the crystals are shaped in horseshoes. The college I work for has a rodeo team and several of the female team members have commented on how pretty it is. What a lucky find! This is my very favorite watch. It is so comfortable. It is beautiful to look at and definitely looks real expensive. It works like a charm and I just love it. Really love my new watch. Not bulky or heavy. Had to take it to a jeweler to have it made smaller for me, but cheap fix. "my wrist is 6" - can the watch be sized to fit me?" Hello ann, the way the bracelet is designed it may be difficult to size it down to 6" inches. You will need to have a jeweler look at it to determine the sizing. Please let us know if you have additional questions. Thanks for shopping with us. Style, price, swiss quartz. Looks pretty. Hope it lives up to it's recommendations. Very dressy for a "Special Occasion." I was looking for something dressy and different for my wife for Christmas.